Since writing my last post, I have been hunting for barrettes (not a very long period of time, admittedly). All I have at the moment are bobby pins, which are functional and fine, but I want something pretty. Until I happen across something vintage that I like, or until one of the Rodarte carved barrettes magically materializes in my life -- yeah right -- I might try France Luxe, whose hair accessories are made in a small village near Geneva (near the French border, I suppose? The backs of the barrettes say "Made in France"). 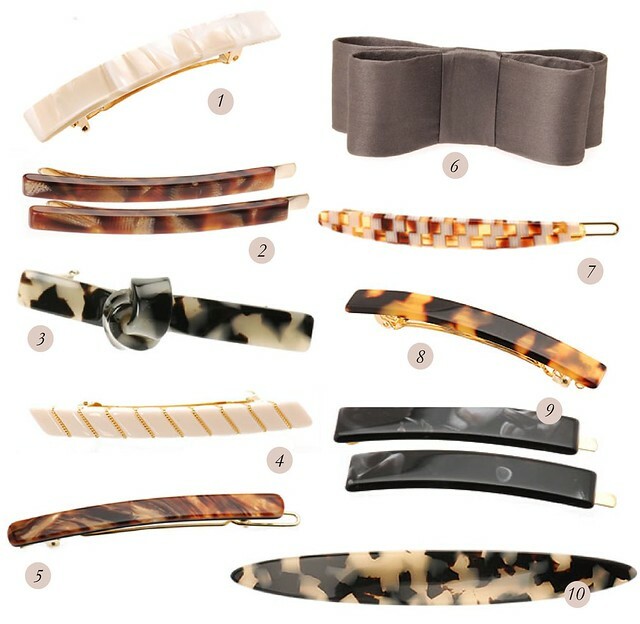 These barrettes seem to be a lovely small luxury, made of the materials I like best. It's probably clear that I like barrettes that are simple, even conservative, and not overly juvenile or ornamental. My hair is a no-Swarovski zone, for the most part (I'd make an exception for the barrette at the bottom of this post). Then, of course, there is the Tabby Cat Barrette in Black -- I love the adorable Marc Jacobs-like, playful quality that it has, but I'm not quite sure that I would be able to pull this one off. kater: Ahhh! I did love the bangs up until I started wearing the sorts of glasses I'm wearing now. Enjoy them! Jane Flanagan: Thanks! The way I see it, people are okay with multiple pairs of expensive jeans or shoes, and those don't even go on your face. Right? Right. Haha. satsuki | zakka nouveau: Yes! It will be so nice to be able to do different things. Chelsea: Thank you! I hope you're able to get the glasses of your dreams. I am really loving this newest pair! Celine: Isn't it funny that it's pretty much all I talk about these days? Haha, I'm so boring. I do like your shorter bangs, though! Jessicat: Hi! Thank you! Yeah, part of why I want to grow out my fringe is because I'm too lazy to get it trimmed as often as it needs it! Ha! Anonymous: Thanks! It's a good one. Beth: Oh man, I can't stand those baby barrettes -- except for babies, of course. It takes me back to the Hole days, I guess. Camille: Thank you! I like a thick fringe so much, but it's just time to pick between thick fringe and glasses. I'll be sad to see them go! Keep yours! kenzie: I think your hair suits you so well as is, so you don't need to change a thing! Fashion Intel: Aw shucks, thanks! Becky: Maybe it is! Time for a change. victoria / cats dreaming in keylime: Thank you! Bre: Ha! Do it. I'm sure it would look really nice! danielle and dinosaur toes: You're sweet, thank you. I think bangs in your case would actually do your pretty face a disservice! You have such great bone structure that it would be a shame to hide any little bit of it. Siubhan: Thank you! I think it's because my hair is finally long enough to attain that "seventies suburbia" look that the Mulleavys were going for... Hair decisions are definitely tough! Good luck to you with yours. Caitlin Rose: I hope you enjoy these barrettes I found, although I know that they are not cheap... I didn't have much luck elsewhere! Rizie: Thanks, girl! Yeah, I love a good fakeout! in dreams: It's okay, I love bangs, I love non-bangs, I love it all. Hair is so wonderful! Have you been in many abandoned buildings? This was my first. It's in the Dufferin Grove area. Kind of a notorious building in the 'hood. Wishcandy: Cute! Chin length sounds great and I can't wait to get there! Caitlin: Aw, I'm glad you enjoyed! Good luck to you in your growing-out journey. Victory Garden Yarn: You know... for years and years and years I wanted bangs, but stylists refused to cut them in. I finally did it myself and was thrilled with the result! But I guess it's hard to say how it will go. I have a pretty large moon face myself! It was a matter of finding that sweet spot of length, I think. stephanie renee: Thank you so much! Twiggs: Thank you! I think I will miss my bangs if I do manage to grow them out, but I can enjoy them on other girls, I guess! avalonne hall: Thank you! Yes, Anna Karina was definitely my inspiration for ordering round glasses. I just love them! And lucky you... SF and HK! I bet you get to see the most beautiful flowers at the moment. Rosie: Ha! We'll see how my attempt goes, too! rebecca: Oh! I rarely see this model get mentioned when people say that they ordered a pair... I guess there are just so many more to choose from now! k: You're welcome, I'm glad you enjoyed! Gillian: There aren't too many around here, but this building is particularly fascinating to us. I'm glad we got to see at least a bit of it (and no dead bodies or anything like that). beckie: Thank you! Good luck to us both, glad you know what I'm talking about! Sarah: Thank you! Her hair does look pretty cute here: http://labyrinthfilm.com/wp-content/uploads/2010/05/Labyrinth-fruit-bite.jpg -- kind of similar to what I'm going for! Sara: I know what you mean -- that's definitely something I'm worried about: if I do grow them out, I might miss them too much! Suzy: Ha! Seriously. Isn't it the best? Caroline: Aw, thanks so much! Lexie, Little Boat: Aw, that's too bad! gbf: Oh you, that is so sweet. Thank you! Joanna M.:I went hunting for barrettes too! Did you come up with anything great? charlotte farmer: Aw, man! Sometimes I think I hate the fringe! I'm sure I'll cut it back once I've grown it out... that's just how I operate. Ha. ro: I looked for some today and didn't find anything! Who knew it was so hard? Kate: Who knew? I mean, I certainly didn't know it would happen. And thanks! I went back and looked at the post and I still think those glasses look good on you! I was actually bummed when I read that you're not getting them anymore! simple barrettes are the best. i have a hard time finding ones that will actually stay put. i need an adult version of those toddler no-slippy hair clippys! Yay! I just bought a way too expensive cat-shaped french barrette that is probably not everyday wearable. Not sure what came over me in the store, but I think it was the adverse reaction to all the crystals and satin ribbons. These are lovely! I've cut a thick fringe (bangs) and then grown it out again more times than I can count! Change is good. But the inbetween stage is tricky. Are you familiar with Australian brand Mimco? They make gorgeous hair clips and barrettes. They have stores in London now, if you pass one while you're here. Also, Tatty Devine in London makes the most amazing hair accessories. They aren't cheap though, but think of them as jewellery! these are so beautiful, try vintage combs too! ow wow thank you so much. This is so nice. And I like what you've chosen, very clean and classic. I Especially like #1 and #3. You'll be such a lady in them! perhaps your next post can be on where to buy white gloves. oh my gosh these are all SOOO CUTE!! thank you for this post! ah, do the marc jacobs cats! you can pull it off. i've been growing my hair for about a year and it bugs me so much that most of the time i have my hair clipped to the side... but then you go and get it cut on a whim and then you're kinda back to square one. i vote the cat barrette! Love them all. I have been looking for good barrettes too, but have yet to find THE one. My hair is SO thick so I need one that can hold it in place. The Rodarte ones are so pretty. I love how serious you are about finding the right barrettes! I would probably walk over to the drug store, buy the least ugly barrette available, and swiftly regret it when the thing turned out to be crap. You have a patience and persistence for quality that extends to the details, and I admire that. Also, that photo is so pretty I could cry. I love your collection, I too fuss over hair accessories to the point that often I end up with nothing in the long run. The photograph is AMAZING! Such a pretty collection and I'm loving your side swept bangs. back when i had long enough hair to put up, i used to use hair clips all the time (up in a twist! so easy! ), and so i've built up quite a collection. i have a lot of vintage ones, with rhinestones or made from other fancy stuff, and i actually found a few good ones at holt's, that weren't that expensive, either. all that to say, man...even with my supershort hair, do i ever want some of these hairclips! that one with the bow in particular. siiigh. i think you can pull off the kitty clips. it's sort of like when i wear a st james shirt, roll up my sleeves and confuse the heck out of every person in the room. the unexpected is really fun. you'll turn around and bam! kitty clip attack! didn't know barrettes can be that beautiful. h&m sells some pretty, classical looking barrettes for cheaps, but being cheap, I end up losing almost all of them. maybe it's time for me to invest in some nice hair pieces too. elle fanning looks way too good. Stunning photo of Elle Fanning - I actually just watched her in the movie Somewhere (such a breath of fresh air!). I'm so excited that I stumbled across your blog (found it whilst on the WORN fashion journal site) - I really enjoy your writing style and the photos, however I still have lots of exploring to do! I've just started a blog which I'm quite excited about - it's been great connecting with other bloggers! I'd have to agree about the no-juvenile or ornamental hair accessories, I can't carry them off either. I think my face is just too serious for them. Some girls look so darn cute in them though. I never quite know what to do with my hair, so whenever I see posts on hair accessories I sit and stare in wonder at more ingenious ladies who seem to have been born with the accessorising gene. i'm always scared of growing out my fringe - years and years of wearing clips and pins - these look like they'd ease the pain! How beautiful that capture of Elle Fanning is! I like the France Luxe selection. Thank you for sharing the link. I've also found good candidates at J. Crew. In the last week or so I have been having a love affair with barrettes again. And when I say again, the last time I probably wore a barrette was when I was a pre-teen! Love your blog, new here and I intend on coming back again and again!